Leeds United’s players arrived back from their tour of Italy yesterday talking positively about the intensity of their training camp but the football played during two weeks in the Dolomites did little to showcase the true ability of the new faces who flew home with them. A record-breaking rout of a local amateur team and an 11-a-side match arranged at short notice after opponents from Romania failed to show up were games on which nothing could be gauged beyond the fitness of United’s squad but five domestic friendlies between now and August 2 will shed light on the foreign signings made in the past fortnight. The club’s pool of senior professionals was three heavier on the flight home than it had been when they travelled from Manchester to Verona on June 30, increased by players whose profiles have grown immeasurably in Yorkshire since they finalised transfers to Elland Road. United made English goalkeeper Stuart Taylor their first signing of the summer but Marco Silvestri, Tommaso Bianchi and Souleymane Doukara are better examples of how United’s approach the transfer market has changed. That approach is driven by Massimo Cellino and unashamedly so. The recruits are players he has either previously taken to Cagliari - as in the case of goalkeeper Silvestri - or found reason to admire during his years as a club owner in the Italian leagues. All three met his requirements and accepted an invitation to play in England for the first time. United’s five home-based friendlies, starting at Guiseley on Saturday, should demonstrate how well they are likely to meet the requirements of the English game. Doukara is the youngest of the three at 22 - a versatile forward who was born in Paris but played professionally in Italy alone. Rovigo and Vibonese, two small, lower-league sides, were his first clubs but he joined Catania in 2012 at a time when the Sicilian team held a place in Serie A.
Catania blooded him cautiously without ever cutting him loose. His time on the pitch in the 2012-13 season amounted to 270 minutes or thereabouts - the equivalent of three full appearances - and Juve Stabia, a Serie B club, took him on loan in September 2013. Doukara played 17 times and scored six goals but Juve Stabia were rapidly relegated with 19 points. Renato Maisani, assistant editor of goal.com in Italy, said Doukara was more comfortable as a winger than a centre-forward and at his best as one of the wide attackers in a front three. He described Doukara as “Dr Jekyll and Mr Hyde” and said the youngster appeared to have found his level during his loan at Juve Stabia. “When I watch him during friendlies or training he seems to be a very good player but during official matches he struggles,” Maisani said. “Perhaps because he is young. “Last season on loan at Juve Stabia, especially when the team was virtually relegated, he coped very well. This maybe confirms that he suffered from pressure (at Catania). Serie B is surely more suited to his talent. There is a common theme between Doukara, Silvestri, Bianchi and others who Cellino has identified as potential signings. The majority are, or were, Serie A players with no real or immediate prospects at their Italian clubs. Silvestri is a well-regarded keeper, a former Italy Under-21 international, who signed for Cagliari on loan from Chievo while Cellino ran Cagliari last season. Aged 23 and 6’3” tall, he was permanently trapped behind other, more experienced options at Chievo and completed loans at Padova and Reggiana before coming to Cellino’s attention. Silvestri was, in Cellino’s mind, a must-have player this summer and a preferred replacement for Paddy Kenny, United’s first choice for the past two years but a keeper who is out on the cold and missed the club’s pre-season tour. Silvestri’s transfer was set in motion in the early stages of June and the fee paid to Chievo last week is thought to have been in the region of £400,000. 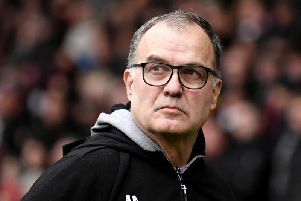 Vincenzo Sardu, a Sardinian-based reporter, predicted that Silvestri would thrive over the course of a four-year contract at Leeds, a deal which will take him beyond his 27th birthday. “Silvestri is a great goalkeeper,” Sardu said. “He needs time and patience and but has good technical qualities. Bianchi’s experience, while largely gained in Serie B, is in a different league to that of Doukara and Silvestri. Between Piacenza, Modena and Sassuolo - the club who Leeds signed him from on a four-year deal - he amassed almost 200 appearances. Bianchi became an Italian Under-21 international against Wales in 2009, named in a squad which also included Mario Balotelli and Federico Macheda, though he failed to sustain his international involvement for long. “When Sassuolo gained promotion to Serie A, the central midfield was made up of Francesco Magnanelli and Tommaso Bianchi,” Giulianelli said. “Of the two midfielders, Bianchi had more quality. “Despite of his young age, he always showed good personality and last season he played as a real leader for Modena in Serie B, scoring three goals in 38 appearances and getting to the play-offs for promotion. Leeds expected to complete a fourth foreign signing last week but a deal to take defender Jonathan Rossini on loan from Sassuolo collapsed over the weekend amid concerns about the Swiss centre-back’s fitness and suggestions that he was reluctant to leave Italy. Cellino claimed Rossini “didn’t have the right attitude to join Leeds” and Rossini gave his own explanation in a statement, saying: “With deep regret I am unable to accept a transfer to this prestigious club, of which I would be honoured to be a part.